BEE RATED sends Client an initial information pack containing the following documents: ‘Verification Process Outline’; BEE RATED Overview; Pre-Proposal form. Client returns the completed Pre-Proposal form to BEE RATED. BEE RATED reviews the Pre-Proposal form and if it meets the requirements prepares and sends a formal Proposal to Client. Client returns the Acceptance Agreement, Annexure 1 in the Proposal document, to BEE RATED, and makes payment of the 30% mobilization fee. BEE RATED forwards a ‘BEE Questionnaire’ to Client for completion and return to BEE RATED within six weeks of receipt. BEE RATED assesses the completeness of information contained in the Questionnaire, and engages with Client, as necessary, should there be outstanding information required. BEE RATED provides Client with a Verification Plan, and a date and time for the on-site assessment is agreed. 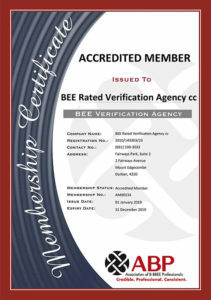 BEE RATED’S verification team conducts the on-site assessment and verification of Clients B-BBEE status. BEE RATED’S verification team prepares a report and recommended rating. BEE RATED’S verification committee reviews and confirms the rating. Client is provided with a rating report and BEE verification certificate. i) BEE RATED’S verification team is required sign confidentiality undertakings prior to engagement in a verification exercise. ii) A confidentiality agreement is also signed with the Client. iii) BEE RATED clients are required to confirm with and abide by the above BEE Verification process. iv) BEE RATED is committed to providing clients with accurate, professional ratings and service along with the assurance of confidentiality and impartiality (including when managing conflicts of interest). The service fee formally quoted will be based on the specifics of the enterprise, including nature and complexity, eg, annual revenue, number of staff, operational sites and nature of black shareholding.